An improved surface mount remote control provides better boating performance and reliability. 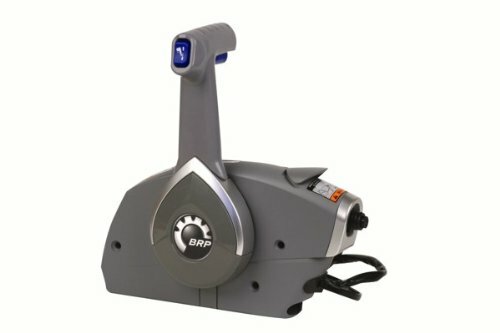 The BRP remote control is designed for more positive shifting and smoother throttle operation. The remote control handle features an exclusive design enabling right or left-hand installation along with a new thumb operated trim switch that is easier to use. The kit includes a key switch, emergency lanyard, warm-up lever, start-in-gear prevention switch, neutral lock and throttle friction adjustment, and warning horn. This control works with 1996 and new outboards. BRP Part# 5006180 This control can be used on 1973-1995 motors with the purchase of an adapter (#176711). This adapter is priced at . You may also need a trim harness (#175898) if you do not already have one. Harness for 1996 & newer engines are #176340(15') or #176341(20') This control uses Type 479 cables. You will need two control cables.